So, What Are Some of the Recommended Generator Power cords? How can you determine the length and the size of the appropriate power cord? What are the advantages of using a power cord in a generator? 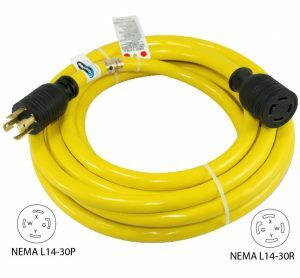 Do extension cords have limitations? Choosing the right power cord for your generator is very essential, both for the safety of your entire home property and efficient electrical power transmission. And for this very reason, you have no option but to choose the right power cord that your generator will use, especially when you’re using a portable generator. From a starting price of $110, you could get this 25 feet long power cord that’s abrasive and durable. Its abrasiveness and flexibility makes it resistant to any temperature. Plus, the company that manufactures this exquisite product is reputable and known for making toughest cords that you can count on during a major power outage. 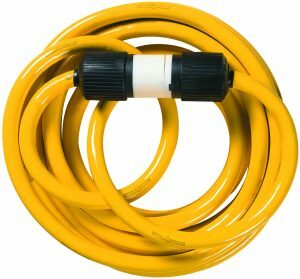 If you run heavy-duty electrical tools and/or appliances, then the Yellow Jacket 1493 10/4 heavy-duty STW 30 Amps/250 Volts power cord is your number one choice. Furthermore, it’s UL listed and OSHA compliant! From as little as $99.99, you could get this 25 feet long, flexible and durable power cord. Its durability comes from its thermoset weather resistant rubber. And for this, it’s suitable for use under any kind of weather condition. Also, it’s equipped with 4-wire 10 gauge (AWG). 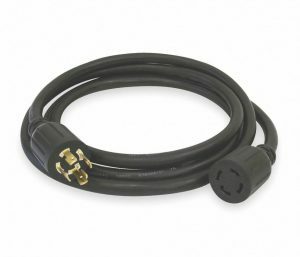 If you’re looking at a 7.5kW generator, then this power cord is up and ready for the task. Just in addition, this great product comes with a 2 year warranty. 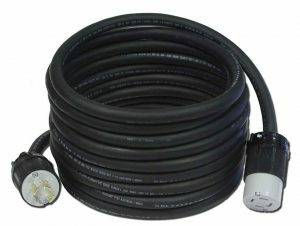 From $135.66, you could source for this excellent 50 feet long power cord from an online store. 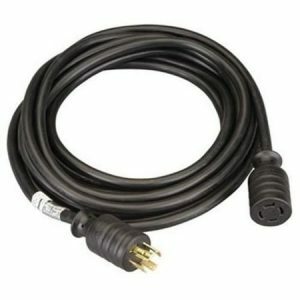 This power cord is recommended to you because of its flexibility and durability. If performs excellently even in hot and cold weather conditions. Plus, it can accommodate larger loads of up to 7.5kW. Upon buying this product, you are given a 2 year warranty on this very product. What more could you ask for when you have a cord that can handle all your electrical tools and appliances that are located inside your jobsite? Another cord that you could use for your heavy-duty electrical power usage is the Reliance Controls PC3010 10 feet 30A L14-30. From as little as $54.97, you could source this cord from online stores. It’s a 10 feet long cord that can handle up to 7.5kW of electrical power. Furthermore, it’s equipped with a NEMA L14320 plug. With this kind of plug, it carries 30 amps without any hassle. With a little at $59.95, you could get this 10-feet long power cord from online stores. Considering that this cord can handle up to 7500 Watts of power, this is a very good price for a generator cord of this caliber. What’s more, it comes with EPR insulation; CPE jacket; separator; copper conductor; and suitable fillers. It also has incredible flexibility and it’s oil resistant. Even though it’s flexible, it has a high tensile strength and a supercool resistance to abrasion. This means that this cord can operate in a range of weather conditions excellently. This is a very suitable cord for your small motor powered tools and other machines. Also, you could use it for your home electrical needs since it’s compatible with homes. This power cord performs excellently for its price tag. The right power cord will handle the amount of electrical power that your generator is producing. Conducting wires or power cords are rated in amps. The higher the amps, the higher the electric current that it can transmit. If your generator is producing a higher wattage, you will have to buy or choose a power cord with higher amps. Calculate Generator Wattage before buying power cord is a good idea. If you choose the incorrect power cord, you risk harming your generator and all your electrical appliances; or worse, your entire home property. Home owners should, therefore, choose the cable very carefully, depending on their generators and the appliances they intend to power up. Choosing the best power cord for your generator doesn’t have to be confusing. In fact, it’s very simple. So, how then, can you choose the right or the perfect generator power cord? Before buying any generator cable, you should know a very simple electricity rule: Higher power wattage requires a higher amps. This means that if your generator produces high watts of electricity, you will need a power cord with a high amps rating. Therefore, one of the things that you should look out for is the amps of the wire or power cord that you are buying. A 50 amps generator outlet will definitely need a 50 amps power cord. The same way, a 20 amps generator outlet will need a 20 amps power cord. Another thing that you should look out for when buying your power cord is the shape of the plug. Plugs are shaped differently to prevent any generator overload. 30 amps plugs come in two different types: 3 prongs and 4 prongs. 3-prong only carry 120V; while 4-prong carry 120V/240. If you have a generator with a 30 amps outlet, you could choose either the 3 prong or the 4 prong plug but make sure that you know the volts that your electrical appliances need. This will help you choose the right shape of plug. For 50 amps generator outlet, you will need a power cord with two dissimilar plugs. Power cords normally tend to resist the flow of current inside them. For this reason, you will need to choose the right length and size of your generator’s power cord. Normally, the thinner the power cord, the more resistant it is to flow of electric current. The thicker the power cord, the less resistant it is. Also, the longer the power cord, the more the resistance. The shorter the power cord, the less the resistance. The resistance can be reduced by either making the power cord thicker or shorter. Choosing the right power cord will ensure that your appliances get the electrical power that they need without any much resistance. Thicker power cables have lower resistance, and they can transmit more amps. For this reason, if your generator’s outlet has higher amps, you will need a thicker power cord. For 50 amps outlet, you will need 50 amps power cords. For 30 amps outlet, you will need 30 amps power cords, which will be thinner. Power generators usually have control panels with numerous 120V outlets; and high current receptacles. For you to be able to harness the electrical power from your portable generator, you need the right plug. The National Electrical manufacturers Association (NEMA) works so hard to manufacture wiring devices, outlets and/or plugs that you could use to connect your portable generator to your electrical appliances. They manufacture different types of plugs with different blade width, shape, dimensions and orientations for use in different electrical situations. Therefore, when buying an extension or power cord, you will have to know the right plug and extension cord that’s best for your generator. NEMA manufacture outlets with ratings ranging from 15-60 amps; and 125-600 volts. Consider the NEMA 5- 15R outlet, which is present in most homes in the U.S.A. In this particular outlet, the ‘5’ represents a 125Volts, two pole three-wired configuration. The ‘15’ represents the amps rating of this particular outlet; and the ‘R’ represents receptacle. The NEMA outlets or receptacles can be divided into two categories: the straight blade, and the twist locking. Straight blade is used for light electrical appliances while the twist lock is used for heavy duty electrical usage, as in commercial buildings. The most common straight blade outlets are the 5- 15R and the 5- 20R. You could identify twist lock outlets by the ‘L’ that appears before their names, for example, the L14-30 which is predominantly used in the United States. Understanding these outlets will help you know the right plug for your generator, depending on your electrical power needs. A mismatch between your generator’s outlet and the appropriate plug and extension cord might be catastrophic to your electrical appliances, including your portable generator. Choosing the right power cord with the right plug is the key to a happy, efficient and, a reliable power connectivity. Generator cables bring with them the ease of connecting multiple electrical devices or loads that are a bit far away from the generator. As such, you don’t have to move your appliances closer to your portable generator when you are using a power extension cord. This brings convenience and immediate solution to your power needs. Connecting your portable generator to your electrical appliances using an extension cord is a very simple task that you can manage by yourself, without any help from an electrician. You can power your appliances at any time, whenever there is a power outage. Lastly, extension cords are very affordable since they are low cost solution to your power needs. Inasmuch as extension cords are very helpful, they come with some drawbacks. For example, they could get damaged by a lot of factors and weather conditions. Most of the time, portable power generators are kept some feet away from the appliances that they power. As such, the extension cord has to run in the open weather; and sometimes, in between doors and windows. They could, therefore, get damaged by weather conditions that might cause corrosion and oldness. Also, extension cords are unsuitable for long-term use. Most of your essential electrical appliances are connected to hardwired main system in your home. Portable generators can only be used to power your plug-and-cord devices. Since most of your devices aren’t plug-and-cord, this makes power cable unsuitable for long term electrical supply.